Dodgers Blue Heaven: Welcome to the Blue, Manny Machado! As for how the team feels about this, check out the below twitter video just posted by Justin Turner's wife. He is enjoying the afternoon on a boat with Alex Wood, and is now celebrating. BTW, Machado wore #13 with the Orioles, but Max Muncy currently dons that number for the Dodgers. Here's what Kenley Jansen recently said about that, via a tweet from Eddie Matz. Kenley Jansen says that if Manny Machado ends up on the #Dodgers, Max Muncy should surrender the number 13 that both he and Machado wear: "He deserves that number. It's his number." Via ESPN; "Orioles trade Manny Machado to Dodgers for five prospects." 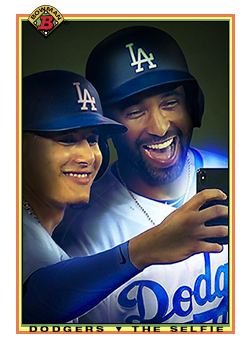 Via MLB.com; "SourcesSources: Machado-to-Dodgers deal complete." 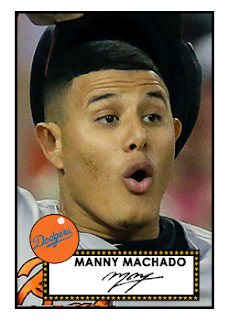 Per David Schoenfield at ESPN; "Manny Machado blockbuster makes Dodgers the NL's team to beat." 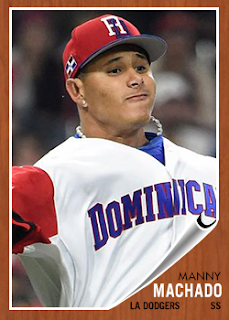 Per Mark Townsend at Yahoo Sports; "Manny Machado headed to Dodgers in 5-for-1 trade." 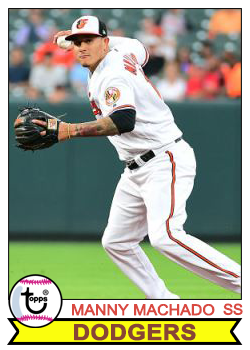 Per Dustin Nosler at Dodgers Digest; "Blockbuster: Dodgers acquire Manny Machado from Orioles." 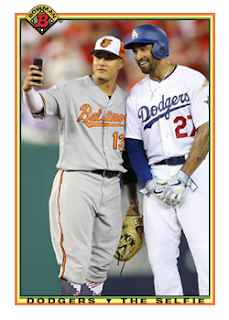 Per Jonathan Lloyd at NBC4; "Dodgers Make Swap With Orioles for All-Star Shortstop Manny Machado." "I had a conversation with Manny. He's a great guy, man, and we would love to have him here," Dodgers All-Star pitcher Kenley Jansen said Tuesday night. "I think the sky's the limit. We can do damage. Let's see what's going to happen." I eargerly await to see what happens, too. In honor and celebration of this trade I made a whole bunch of fantasy custom cards. Check them here, throughout. The Los Angeles Dodgers today acquired four-time All-Star shortstop Manny Machado from the Baltimore Orioles in exchange for Rylan Bannon, Yusniel Díaz, Dean Kremer, Zach Pop and Breyvic Valera. A two-time Gold Glove winner at third base, including taking home the 2013 AL Platinum Glove Award as the league’s top defender, Machado has a .283 career batting average with 162 home runs and 471 RBI in 860 games over his seven big league seasons with the Orioles. He has a .311 career batting average with runners in scoring position and has hit .333 with the bases loaded, including eight grand slams. 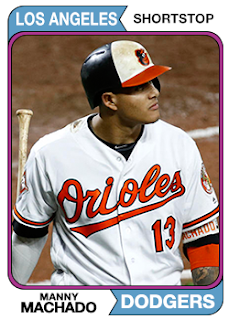 Since his first full season in 2013, Machado ranks among the AL’s best in hits (927, 5th), extra-base hits (351, 6th), doubles (189, T-2nd), home runs (155, T-7th) and slugging percentage (.489, 14th).